I am Pinto! 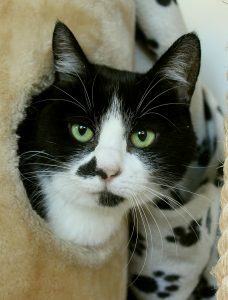 Like the beautiful Pinto horse, I’m a striking kitty with black and white markings and a very loving personality. 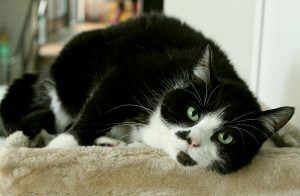 I’m a very mellow 9-year-old lady cat who enjoys attention and is very serious about nap time. I will probably continue to blossom and show my true personality in a quieter home, but I have adapted well at the shelter and do enjoy petting as well as playtime! I am tolerant of other cats and children, but my ideal home would probably be either with older kids or an adult-only, single cat family or person. The doctor says I need a dental but the nice folks at Pixie have me scheduled to get that done, and other than that, I’m a very healthy and hearty girl. All I need now is a loving person to meet me and fall in love! I will be very happy as an indoor-only cat and don’t require a ton of space — I’m the perfect apartment kitty! With the cold weather rolling in, you’ll need a warm, fuzzy, snuggly girl like me in your life. Interested in meeting me? Stop by Pixie today! Let’s make new memories together! I come to you fixed, vaccinated, and micro-chipped for an adoption fee of $100.